Shown below are 2 identical notebooks, issued by the Leyland Motor Corporation I guess at the back end of the 1960s or very early in the 1970s. They advertised the fwd 1300 model, Triumph's quality small/medium saloon. Giveaways like this have always been popular with new-car motor dealers, giving away gimmicky freebies to spread the word about their latest product. 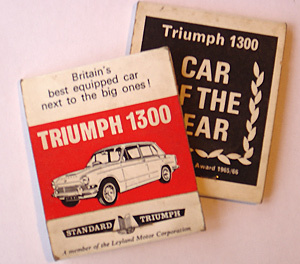 In this case it was the Leyland Triumph 1300 that was being given some coverage on the cover of these neat notepads, which measure 2" x 2.5". The 1300 was "Britain's best equipped car next to the big ones!" which I assume is a reference to the larger 2000 and 2500 models that were also available. Interestingly the Standard marque is still being mentioned despite cars badged as Standards being dropped from the S-T range early in the 60s. The 1300 is not a common sight in preserved circles, largely thanks to their eagerness to corrode away (but probably no worse than any other BLMC creation of the day). The basic styling of the front wheel drive 1300 would be used for the later BL-era Dolomite, although the interior appointments were not quite up to the same spec. The joys of lousy British Leyland quality assurance and build quality in the 70s meant that the post-1300 Dollies would often fall apart with depressing regularity (especially the Sprints and 1850 versions). Don't believe me? have a flick through a copy of Motorsport magazine from the 70s, and the letters pages were full of foaming correspondence from owners who'd bought Sprints, and were having a nightmare with reliability and a largely indifferent dealer network. The earlier 1300 though featured the familiar Standard/Triumph 1296cc engine, which first saw light of day in the 1950s Standard 8 (803cc), and didn't suffer the reliability woes of later cars. In fact we're reminded that it was voted Car of the Year by Car magazine, for 1965/1966.